There is something about white plants that especially attracts. So much so that trainee judges at Moulton are warned about giving prejudicial preference to white spined cacti. 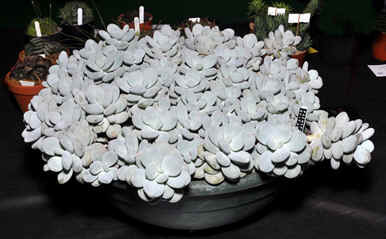 However it is the white succulents I am writing about and there is a fair selection to choose from in several families. Generally the whiteness comes from a dusting of white powder called farina. This can be easily wiped off and you should handle these white plants carefully. Let’s have a look at some from the vast Crassula family. A recent introduction is a plant I was generously given called ‘Mexican Giant’. This has similar white leaves but is somewhat more chunky. There is nothing in John Pilbeam’s book about this but the internet suggests it is a selection of E. colorata (what most of us call E. lindsayana). If so, it should be in the category of easy to grow, but I will not be risking my ‘Mexican Giant’ in the cold greenhouse until I have some hostages to fortune. 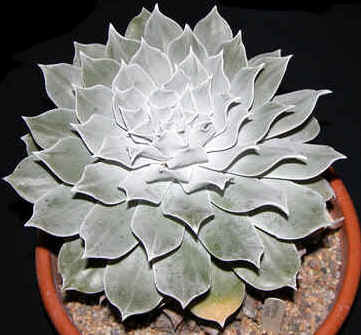 My final Echeveria is rather different; E. leucotricha derives its whiteness from hairs on the leaves. (I expect you knew that leuco is white and trichomes are plant hairs.) Unlike the others which are more or less stemless this makes a shrub. Brick red flowers closely packed along white fury stems are a stunner. Mexico is also home to Graptopetalum and Pachyphytum which I often confuse until they flower; Graptopetalum have red blotches on the petals, (well mostly), and Pachyphytum have hanging flowers nearly hidden by large bracts. 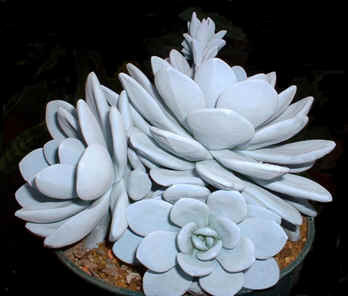 The well-known ‘Sugar Almonds’ Pachyphytum oviferum is the whitest and deservedly popular. There was a huge and well grown specimen at the last National. It is easy to grow, pretty hardy, but I find it slow. Perhaps I should water and feed more! Again the slightest touch will mark for months and they are better watered from below. From Mexico and California come Dudleya, another group of white leaved Crassulaceae. Well I say white leaved but if you see them in habitat or sow habitat seed you will find that many species vary from green to white. We naturally select the white leaved kinds. 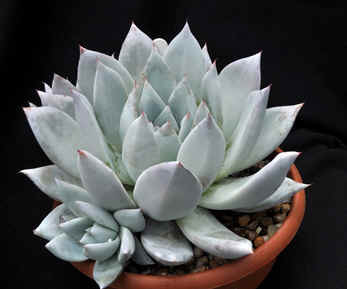 For a large white cabbage, try Dudleya pulverulenta. 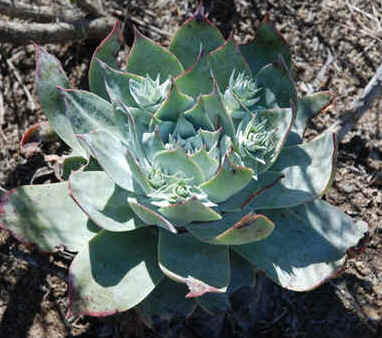 When I saw this growing on Californian cliffs I thought they were Echeverias escaped from gardens. (I have learnt a bit since then.) When I saw them in Mexico there were green ones in the population, not so pretty. Individual heads in the wild were up to a foot across and I have seen clusters up to a yard. It needs to be treated generously with both feed and water or you will have a cabbage with more dead leaves than live. Above: Two Dudleya pulverulenta; the left in habitat in California and right a Zone Show plant from a few years back. Perhaps more manageable in our greenhouses are Dudleya pachyphytum and D. anthonyi. D. pachyphytum has chunky leaves and is slow growing. D anthonyi is a rosette forming plant like pulverulenta but smaller and neater. (I have seen it named as a variety.) 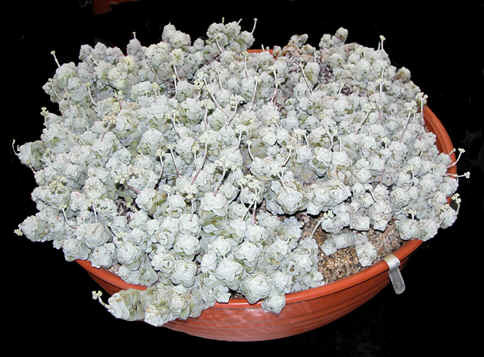 D. gnoma is a popular plant which rapidly spreads into a cushion of small heads. All Dudleyas are easy to grow but they are largely dormant in the warmth of summer and require some winter watering. They are pretty hardy too, surviving frost even when wet. For me, the only other greenhouse (rather than garden) succulent that survives freezing while wet is Conophytum. Left: Dudleya pachyphytum. This cultivated plant in Jeff’s collection impressed me with the leaf impressions. Just like Agave! Right: Dudleya gnoma, slow and steady (and easy) - a show plant which does well to my surprise. 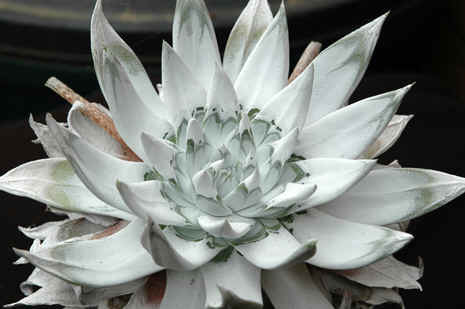 Moving over to Africa we find many attractive white leaved succulents. 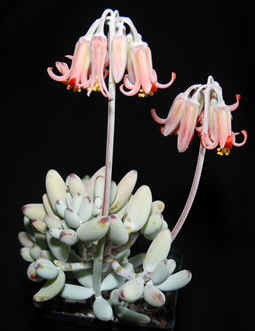 Again in the Crassula family is the shrubby Cotyledon with many white leaved forms. Cotyledon orbiculata has forms with large flat white leaves that are attractive in habitat and widely planted in gardens, (where they call it ‘pig’s ears’). Ultimately it will be too big for your greenhouse as it grows as tall as me. A better form for our cultivation is the one often called ‘oophylla’ with small almost spherical leaves. We see a very nice one at National Shows which is a pan over a foot across. All forms have nodding red, sometimes orange flowers, which are relatively big for the Crassula family. 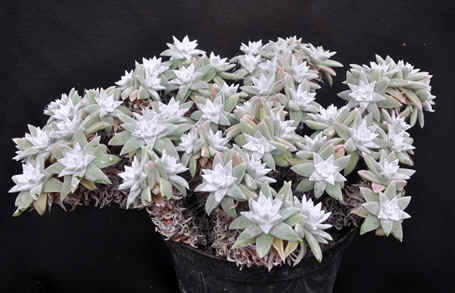 Crassula itself has several attractive white leaved species. C. deceptor in its many forms, makes attractive white cushions. The whiteness here is not farina but minute white dots as seen on Astrophytum. C. mesembryanthemopsis has similar dots but is really tricky to grow well. The slosh of water these winter growers need often triggers fatal botrytis. This was where I came in. Actually the plant which provoked this little article was Adromischus leucophylla. You will remember that leuco is white, so this is the appropriately named white-leaved Adromischus. The young, vigorous sales plants are irresistible with their chalky white leaves. However it is difficult to grow a nice pan-full. After a while it remembers it could be a shrub and wants to grow upwards, then I resort to judicious pruning to keep a compact cushion. So there’s a little selection of my favourite white leaved Crassulaceae. If you are a cactus person you could grow a few sprinkled around to add a bit of colour and interest. (Of course I am not suggesting that cacti are not colourful or interesting!) 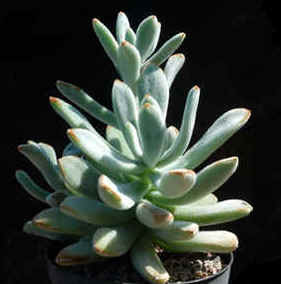 If you are a succulent person you will know there are several other families with white leaved species. Perhaps more later!